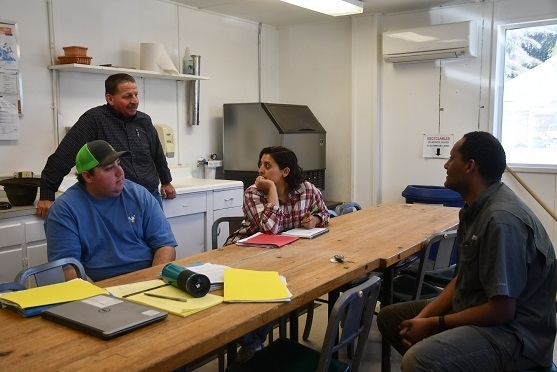 Dr. Teamrat Ghezzehei, a soil physics researcher and professor at the University of California, Merced, along with Jessica Alvarez, a first-year graduate student working with him, sampled soils from the long-standing NRI Project field in Five Points, CA on March 15th. Alvarez is joining Samuel Araya, another one of Ghezzehei's students in using the NRI site as part of her graduate thesis work. The goals of this work are to determine and characterize soil hydraulic properties and functions in each of the four management systems that have been conducted in the NRI study now for twenty years. These systems vary in tillage intensity and also in terms of organic matter inputs to the soil via off-season winter cover crops. 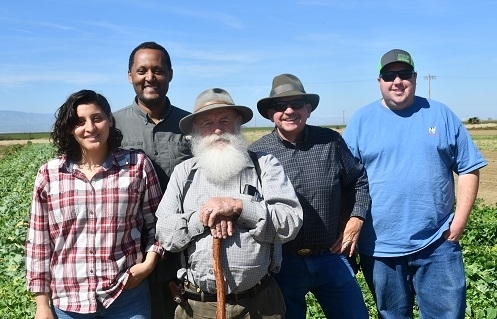 The four experimental treatments are standard tillage without cover crops, standard tillage with cover crops, no-tillage without cover crops, and no-tillage with cover crops. This study site is the only such site in all of California where the reduced disturbance system has been evaluated for so long. Their project has been supported by a grant from California's Department of Water Resources. To date, the study has determined significant changes in a number of soil properties including carbon and nitrogen content, water infiltration, aggregation, and biodiversity. The work of Ghezzehei, Alvarez and Araya will now add a very important piece, - soil water properties and function. We look forward to learning more of what they find soon.